Lesson #2: While our old neighbors are kindly saying they miss us and it’s too quiet without our family around, I’m guessing our new neighbors would beg to differ. Lesson #4: While I decided to wear a post-shower robe in an effort to show my kids that we actually do have some boundaries in our house, they proceeded to rub their faces all over the soft, cozy thing — while I was in it, of course — proving me oh-so very wrong. Lesson #5: There are times when you can’t help but feel at peace as you sense the presence of a loved one’s spirit. It is not, however, in the middle of the night when the bathroom’s motion sensor light repeatedly goes on and off when everyone is tucked in bed, sound asleep. Lesson #7: While there’s no good time to have your kid walk in the kitchen and ask, “What smells so gross?! ?”, it’s especially alarming when it’s while you’re making dinner for neighbor. Lesson #8: I’m pretty sure I should be offended. Every time I play dolls with Pink, her babies don’t like anything their mommy cooks…at all. Lesson #9: Never underestimate the entertainment value of having a porta-potty in your yard. Lesson #10: Technically I had nothing to do with Big’s 3-2 record at his first debate tournament, but I have to think giving him years worth of points to passionately protest certainly didn’t hurt. 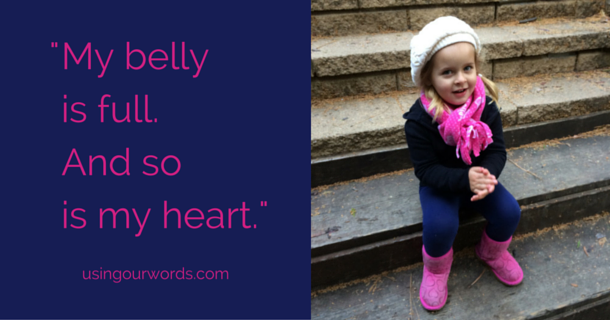 Here’s to a week with more wins than losses, and bedtimes where you find your bellies and hearts wonderfully full. If you want to ensure good things come your way, follow Using Our Words on Facebook, Bloglovin’, or by subscribing to get my posts in your inbox (simply put your email address in the box at the top/right of this page and confirm when you get the email!). And don’t miss my latest on Huffington Post, Pop Sugar Moms, or Medium Foreword (ok, this one isn’t by me, but I’m in the audience…that counts, right?!). I’m guessing that Pink will be dressing that blue porta potty with pink Hello Kitty stickers!! I have had the pleasure of eating your delicious home cooked meals-you are too hard on yourself-you are a great cook!! 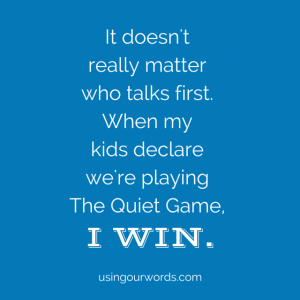 Silent game…seen it in action…I could see you winning but resisting those adorable faces about to explode in laughter…don’t think I would last long:). Love those little moments and you! Always enjoy your lessons posts! !